Search Engine Optimization, SEO is taken after to enhance search engine rankings of a page and has changed approaches including Black Hat SEO techniques. This specific way has practices focused only on search engines and you as a marketer need to have a clear picture of rules to follow under the spectrum. You are supposed to certify the quality of user experience and thereby, should abstain from using techniques just for the purpose of manipulating Google. Below written are few Black Hat SEO techniques that hurt your site’s positioning in Google search results and more or less influence your site’s traffic too. Keyword stuffing is about stacking a website page with keywords in its Meta tags or content. The strategy is no longer pertinent as Google’s search and ranking algorithms ban or penalize such sites in search ranking, either briefly or for all time. Overusing keywords make your page spammy as the content doesn’t look natural and so, you should concentrate on approaches to create findable content. Cloaking is measured as a broadly used Black Hat SEO technique in which the content offered to the search engine is different from that accessible to user’s browser. These must get avoided as Google uses its search algorithms to locate the exercises and when discovered blameworthy, such websites’ rankings get hurt or are even banned from search engines completely. Buying or exchanging links for SEO purpose has disadvantages as it really affects a website’s ranking. Though, the technique being effective was practiced earlier, now is supposed to get avoided as Google algorithms discourage these activities. You should focus on building links naturally instead of going for paid link options. Link exchanges guarantee your webpage to get heaps of links in lesser time, though SEO endeavors to go to squander as Google’s Penguin update find and consider such sites as spam. Article spinning is an activity very much similar to the plagiarized content issue. The practice involves using special software which rephrases the copied content to be used later on as a new & uniquely written post. The specific alteration lowers the risk of plagiarism and as Google Panda’s update works; it degrades your site value and penalizes it for the violation. Anchor text is the clickable text in a hyperlink and it gets optimized with the use of keywords on which a site wants to rank. For example, if a site wants to rank for the term “digital marketing institute,” it would use the anchor “digital marketing institute” to link to its digital marketing institute site. The practice worked great until Google cautioned this activity against measured algorithmic penalization and now collects a big no-no in SEO. Google Penguin updates look for optimized anchor texts while indexing your site and lowers your rank or penalizes you on finding accountable. The Link-wheel is an idea under which numerous themed websites are brought together to create a circle of links. 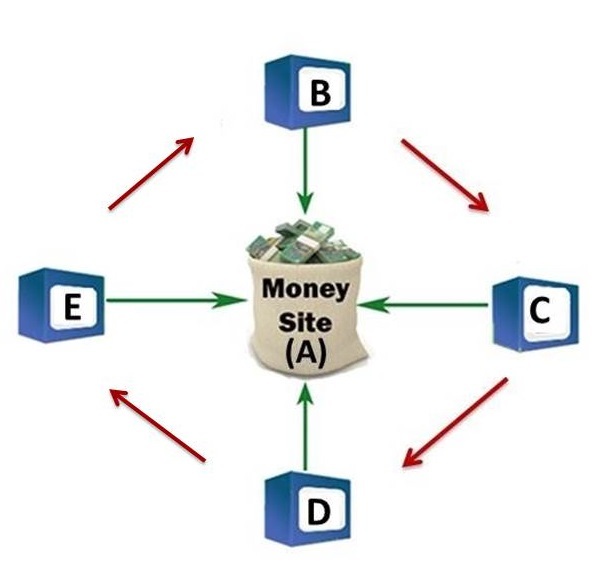 For example, there are four websites; A, B, C, D and E, if A is your main website (money site), B, C, D and E link to A reciprocally and then, B links to C, C links to D, D links to E and E links back to B, completing the wheel. Earlier, link wheels were used trying to trick out search engines through spammy manipulation of reciprocal links. But, as search engine algorithms are now aware of the pattern, it is not recommended anymore. There are a few ways to conceal text on a page, using white texts on white backgrounds, locating text behind an image, using tiny font/div tag or using hidden links or texts in content to control Google’s search rankings is seen as misleading and is a violation. Google devalues hidden content using its automated system that results in penalization of a website. Spam Comments are worthless messages and non-related promotional links and usually appear when sites/blogs stay open for commenting with no quality control. The procedure is taken after to make free backlinks, yet as prompting no-take after reaction, is a complete waste of time. As a part of site optimization, you must prevent spam comments before these make your reader uncomfortable and blog unprofessional. Writing for search engines is helpful only when not done rigorously or in a spammed way. There are several sites/blogs that use spam means to publish post such as text rewriting, using automated ways to create content or others. These practices must be kept at strategic distance as Google’s Panda Update detect such spam content and eliminate it from rankings. Also, lengthy write-ups (500-800 words) don’t look impressive anymore. To write useful and relevant content is the best practice to draw in readers to your page, even in terms of SEO optimization. Above mentioned are the few Black Hat techniques that results in deindexing of sites in Google search rankings. You should keep away from these short term ranking schemes and go with the decent practices. There are a number of ways that work to mend website visibility in a genuine way, these may require significant investment yet have better risks for survival in the long-term.